I’m really proud to be part of a new publication, This Is Brent. 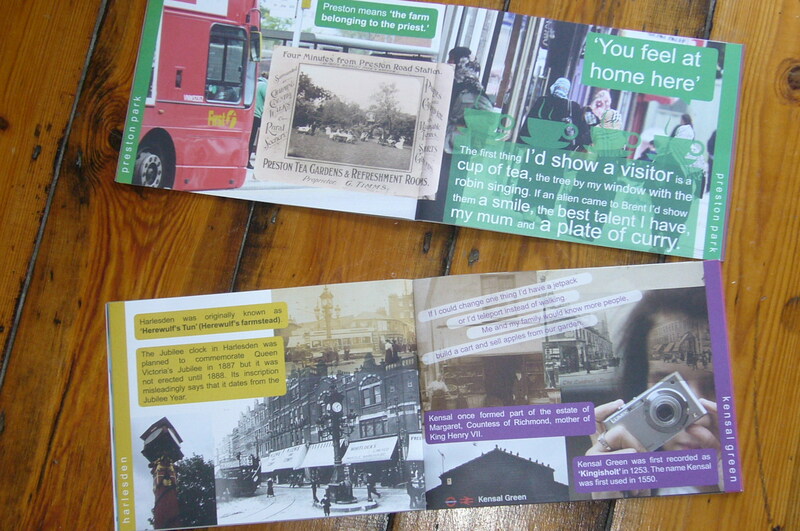 It’s the result of a project at Brent Museum and Archives during which a group of young people were invited to become cultural researchers, gathering information, taking photographs, conducting interviews and generally exploring the borough past and present. The publication includes the poem ‘In Brent I’m on top of the World’, which I wrote while I was Poet in Residence at Willesden Green Library. Artist Alex McIntyre and I wanted to find ways of animating our exhibition space so we created a writing wall where the public and young people involved in the project could leave comments about their environment using prompts and questions we provided. The poem was formed by rearranging their comments, with sometimes surreal results. It’s called crowd-sourcing, I think! It’s great to see it combined with the young people’s own discoveries. To see the whole book, click here, then click on the book cover to flick through. You can also find the poem in an easy-to-read version on the page about my collaborations with Alex by clicking here.